Greek man in traditional fustanella. 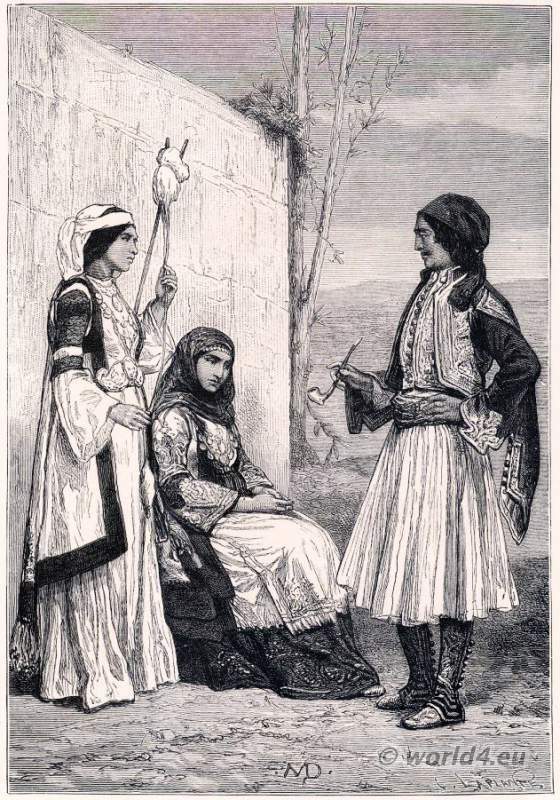 Greece People near Athens 1830. Home » Greek man in traditional fustanella. Greece People near Athens 1830. Greek man in traditional fustanella. 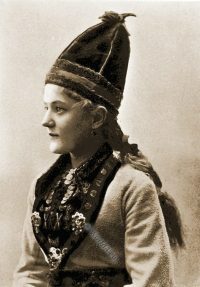 The fustanella, the pleated skirt (Albanian fuštan) is on the Balkan Peninsula since the 5th Century demonstrated. It is part of the Greek and Albanian men of the traditional clothing. It was formerly known as Albanians shirt, part of the national costume since it was there until the Tirq, a felt pant has been replaced by the end of the 19th century. The origin of the fustanella goes back to Italy. The word meant there Fustagno “the skirt” and it designates the type of fabric, a kind of cotton flannel. In Latin there is the name “fūstāneum” what “hard fabrics” means. 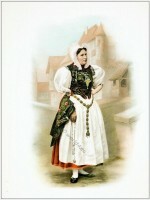 The fustanella as part of the Greek national costume, is in contrast to the fustanella of the rural population, from finely brushed and shiny cotton. Before the Greek Revolution (Greek War of Independence against the Ottoman Empire) of 1821, the fustanella was mainly worn by the Klephts (Greek Kleftes). The Klephts or Kleftes lived as irregulars in the rugged mountains of Greece, subsisted on robbery and hunting and were mostly on the run from the Ottoman judiciary. For reasons of better camouflage they worn dark colored instead of the traditional white colored Fustanellas. The word Kleftiko is a corruption of Kleftes and referred later to a Greek meat dish of lamb or goat with name “by robbers kind “. Fifty years before the Greek Revolution started, they organized the resistance against the Ottoman Empire, and thus establishing the myth of freedom fighters. The Greek population commemorates the Kleftes today in legends and songs. Since the fall of Constantinople in 1453, Greece was over three hundred years part of the Ottoman Empire. In 1821, a long-planned revolt against the Turkish occupation began, which ended in 1830 with the founding of a Greek kingdom. The Greek Revolution (1821-1829), was a national levying of all Greek population against the Ottoman occupation and the fustanella became a symbol of rebellion. Note in this context the unique music of the Greek Repetika. It is also called the Greek blues or tango. Originally from the taverns at the port of Piraeus, it spread through the Greek emigration at the turn of the 20th century, to the world. But never reached the popularity of the above mentioned blues or tango. Perhaps because the Greek language? Read more: The Ancient Greek Costume by THOMAS HOPE. Woman from Solothurn in Oltnertracht. People in traditional clothing from Zadarska Zupanij. Woman from the island of Santorini. Greek Priest in Eastern Orthodox Vestment, 1900. Woman of the Islamic faith of the Druze. More info: Rembetika music is the music of the Greek Underground by Matt Barrett. This entry was posted in Ancient Greece, Hat, Traditional and tagged Greece national costumes on 9/12/13 by world4.